Last Saturday Royce & I drove to Sydney to go to the Good Food & Wine Show at the Exhibition Centre Darling Harbour. we left home at 7.30 and arrived in Sydney around 10.30ish. we met up with Mart one of Royce's school friends. We were a little disappointed with the food stalls - I was hoping to see more primary producers but it seemed to be focused more on packaged products and lots of kitchen appliances and utensils. There was a lot of wine to taste but neither of us was in the right frame of mind for wine, so we limited our tastings to 4 or 5 stalls (there would have been well over 150 wine stalls). 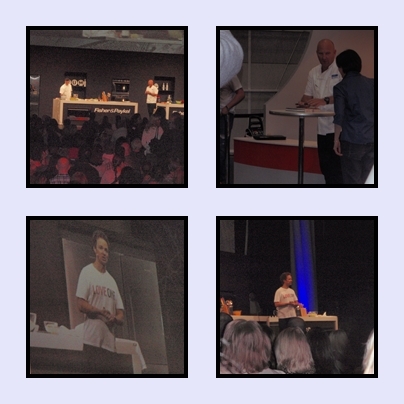 We attended Matt Moran's cooking show followed by Tobie Puttock's. We really enjoyed Tobie's and found that we learnt more at his demo that we did at Matt's. AS Royce had been very unwell for the week leading up to the show we left pretty much after the cooking demo'. Royce drove us out of the city and we changed over at Miranda Fair where we stopped for a food break. We were wandering through the fruit & vegie shop where we ran into Royce's 2nd drama teacher from 1998, Royce had not seen Rod since he was in the Wizard of Oz with him in 1999. It was a lovely surprise.